NFL WEEK 13: With twelve weeks behind us and five remaining, we are entering the home stretch of the NFL’s regular season. Playoff scenarios and seeding concerns will come into focus now, which means we’ll get some truly meaningful games in the weeks ahead. On the flip side, this is also the time of year when we begin to see certain teams deprioritize winning games in hopes of bettering themselves for the future, which often includes two things that go hand-in-hand: playing young players for developmental purposes and losing games in order to improve draft position. 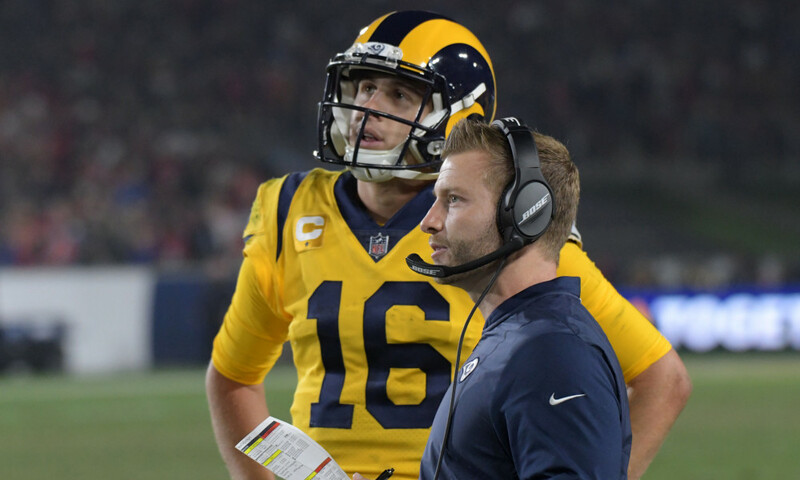 After looking dominant on both sides of the ball early in the season, the Rams have seen some slippage on defense lately, surrendering a mind-boggling 127 combined points in their past three games. Fortunately for them, they face a Detroit offense this week that is just about as non-threatening as the NFL has to offer— the Lions have scored 22 points or fewer in five straight contests, averaging a meager 16.2 ppg in that span. The passing game really took a hit when receiver Golden Tate, who had been Matt Stafford’s go-to guy for the past few seasons, was dealt to the Philadelphia Eagles a few weeks back, and early this week the Lions announced that they were putting Marvin Jones— the team’s longtime starter opposite Tate— on injured reserve, so Stafford is left with an inexperienced, unproven group of pass-catchers. I mean, when Kenny Golladay is your number one option, you’re not going to be keeping opposing defensive coordinators up at night, let’s put it that way. And for all the issues the Rams have had on defense, the offense has been downright scary, ranking second in the NFL in yards per game and third in points scored (35.4 ppg). The Detroit defense has had major issues against the run this season, surrendering 4.7 yards per carry, so Todd Gurley should have a big game here, and nobody has been able to slow down the Jared Goff-led L.A. passing attack, so I wouldn’t be expecting miracles from a Lions secondary that gave up 357 passing yards to Cam Newton and the run-first Panthers just two weeks ago. Don’t expect home-field advantage to save the Lions here— the Rams are far and away the better team, and this one has all the makings of a blowout. The wheels have officially come off in Jacksonville, as the Jags have lost 7 straight games and have been effectively eliminated from playoff contention. It’s a steep fall from grace for a team that was just minutes away from the Super Bowl last season, and it just seems to be getting worse— the injury-ravaged offensive line lost another starter for the season this week, quarterback Blake Bortles and been officially benched for journeyman Cody Kessler, and the once-proud defense is no longer playing like an elite unit, with many pointing to effort— or lack thereof— as the primary culprit. This week division-rival Indianapolis comes to town, and the Colts have been moving in the opposite direction, winning five straight games to vault into the thick of the AFC playoff race. One of those wins came against these Jaguars three weeks ago, as Andrew Luck threw for 285 yards and 3 touchdowns to lead the Colts to a 29-26 victory. If you’re a Jags fan, there are actually reasons for optimism looking back at that game— the Jags outgained the Colts, with Bortles putting up 324 passing yards in a losing effort. But, of course, Bortles won’t be out there this week— it’ll be Kessler, a guy who has appeared in 13 games over the course of his career and has seen his team go 1-12 in those games. He’ll be playing behind one of the NFL’s worst o-lines, and he’ll be without the assistance of workhorse RB Leonard Fournette, who has been suspended for this game after throwing a punch in last week’s loss to Buffalo. This is absolutely a must-win game for an Indianapolis team with playoff aspirations, and even if the Jacksonville defense were to show some pride and return to form, I just don’t think the Jags offense is good enough to prevent an eighth straight loss. After a stunning blowout loss in Tennessee the Patriots got back to their winning ways last week, cruising to a 27-13 victory over the hapless New York Jets. Still, the issues that were exposed in the Titans loss remain, and though Tom Brady’s brilliance might be enough to carry the team most weeks, the blueprint to beating these Pats is now out there, and it’s been followed by all three teams that have gotten the job done this season. In all three of their losses, the Patriots haven’t been able to run the ball, totaling fewer than 90 yards rushing in each game. In their 8 wins, they topped 100 yards rushing each time. The running game has sort of been the “secret sauce” for the New England offense for years now, and never has it been more apparent than this season, as the offense has been mostly devoid of perimeter weapons and Rob Gronkowski has battled nagging injuries. If you can shut down the running game, the Patriots offense can be made to look like a dink-and-dunk, non-threatening unit. We last saw it two weeks ago, and the Minnesota defense, which ranks 4th in the NFL against the run and is surrendering just 3.7 yards per carry, is certainly capable of smothering the run. And when you look at the matchups on the other side of the ball— particularly Adam Thielen and Stefon Diggs vs. the New England DBs— you realize just how dangerous a game this is for the Pats. New England ranks 22nd in total yards allowed and 25th against the pass, and the Vikes rank 7th in the league in pass yards per game and have scored 24 points or more seven times this season. Minnesota badly needs a win here, and this appears to be a pretty good matchup for them. When you add 5 points to the mix, this becomes a must-bet game for me. Winners of 7 of 8, the Chargers are among the league’s hottest teams, and after letting a double-digit second-half lead slip away in a frustrating loss to Denver in Week 11, they responded the way you’d expect them to last week, scoring 45 unanswered points to rout the flailing Arizona Cardinals. A tougher test now awaits… but just how tough, exactly? Sure, the Steelers had won six straight games before losing in Denver last week (maybe we ought to keep an eye on the Broncos, eh? ), but they played really poorly in a Week 11 victory over Jacksonville, trailing for nearly the entire game before pulling it out in the end, so it wasn’t like last week’s performance came out of nowhere. Ben Roethlisberger’s carelessness with the ball is starting to become an issue— only Sam Darnold has thrown more interceptions this season than Big Ben’s 12, and the Chargers have a talented secondary that ranks 6th in the NFL with 11 picks and is holding the opposition to just 227 pass yards per game, the 7th-best mark in the league. Roethlisberger has long played better at home, so I do expect a quality performance out of him this week, but he’ll need it if he plans on out-dueling Philip Rivers, who completed 28 of his 29 passes last week (!) and is in the midst of a tremendous season, ranking 3rd in the league in QB rating (115.7) and throwing 26 touchdown passes and just 6 INTs. There really is no obvious weakness on this Chargers team, and their recent run has been nothing short of dominant, as 5 of their past 6 wins have come by 8 points or more. Count me among those who think that they just might be the best team in the AFC— they’re only a game back of Kansas City, and they have a much better defense— so the chance to back them as a 3.5-point ‘dog against a Pittsburgh team coming off back-to-back poor performances in just too tempting to pass up.